Her curves, pale green eyes, and spitfire personality are what draw Jackson to Amelia. His best friend, Will, is what pulls him away. 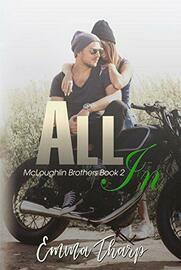 Amelia Stanton has always had a crush on her brother Will’s best friend, Jackson McLoughlin. But he’s a player and has never taken a second look at her. Until a chance meeting brings them together and the truth about their feelings comes to the surface. When the unthinkable happens, will Amelia and Jackson make it through an unexpected pregnancy or will Amelia’s brother, Will, put an end to them before they even begin? With the odds stacked against them, can Amelia and Jackson rise to the occasion or sink before they even have a chance to swim?